Reminder, our usual monthly (First Sunday of the month), planning/info meeting is coming up Sunday. And after that there will be the First meeting of the planning group for Hacker Scouts. Below is a link to the Agenda, its a work in progress, and as usual the meeting notes will be appended to it. please show up on time 4:30 those who do show will be included in the headcount for pizza. It is with great enthusiasm that I announce an addition to our programming. At Hacker Scouts, our mission has always been very clear to us. While our Guild must maintain an age limit to encourage and support complex concepts and skill building at a developmentally appropriate level, Open Lab has always remained all ages. We really try in Open Lab to always have at least one or two activities that can be modified for our younger Makers and engage whole families. We hear fairly regularly, however, from parents who would like to have a more consistent experience like Guild for their younger children. When we joined the fiscal umbrella of the School Factory, we merged with Maker Scouts but kept our name. We are now pleased to announce that Maker Scouts lives on! A fully developed program for ages 4-8 that meets weekly, Maker Scout Guilds will focus on STEAM concepts and activities, and build confidence in our youngest makers. It will also give them a solid foundation for when they are old enough to graduate into a Hacker Scouts Guild. Go here to read more! We are currently looking for leaders for our Oakland and South Bay Maker Scouts Guild. If you are interested, please let us know. Also, we are very close to securing a location for the South Bay Hacker Scouts Guild and hope to be starting next month! We are also in the process of forming Guilds in Seattle, Los Angeles and Brookville, MD (just outside the Washington DC Metro area). If you are in these locations (or know someone who is) and would like to be involved, contact us! Reminder: Open Lab is this Sunday 2/17 from 2-5pm! Awesome Wood Gliders that soar incredibly high, beautiful Handmade Books, and amazing Tesla Coils! Jarick Cammarato joined us from Maker Scouts as our Director of Youth Outcomes,and is the Guild 003 leader in Charleston SC. Jean Kaneko from the Exploratory in Los Angeles joins us as Director of Maker Scouts. She and her team have an extensive background in early childhood education and Making, and we will be working closely to consistently align the two programs. Finally, we are migrating to new websites: hacker-scouts.org and makerscouts.org up and almost complete! Thanks for your patience as we get all the information posted. If you have any questions or interest in any of our programs, please contact us! You too can make these! Solar Jar workshop at Quelab tomorrow(thursday) night at 6pm. This hasn’t been advertised at all, and there are very limited seats. 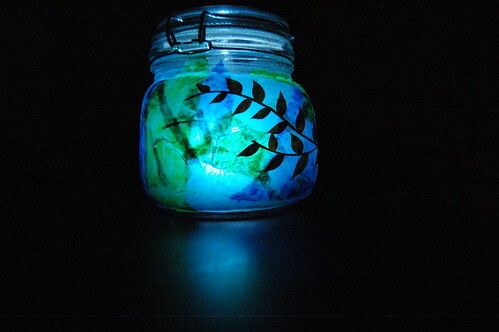 We’ll be making these cool jars from solar light components. Please RSVP so we can be sure to hold a seat for you. $15 covers the workshop and supplies. Looks like its all full up! feel free to comment if you would like to see another workshop on these. I’m checking back in with everyone because we’re in the home stretch of the Space Chile Project(High Altitude Balloon launch and recovery Containing the seeds for tasty tasty green chile! And cameras, and GPS….). If you’ve been hiding under a rock for the past month, please come to hacknight Tuesday so that you can get back up to speed before our first launch opportunity on Sunday, 15 July. I’d like to have all hands on deck to review the operations and checklist information so that everyone will have an idea of what will be going on next weekend. This is especially important for those who will be helping with the set up, filling, launch, chase, recovery, and documentation of the event! More Instructable Fun, Candybar Rocket Instructions up! One of our members doing what he can to promote our little Hackerspace, Posted plans/instruction for how to build the working Milkyway Rocket engine. 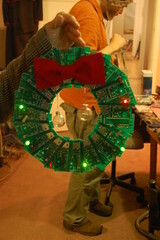 Looks like its a popular Instructable, this morning they made it a “Featured Instructable”. Here are links, and recipes, and photos from this last evenings awesome “Hacking Chocolate: event! Photos of the event can be seen here, http://www.flickr.com/groups/quelab/pool/tags/hackingchocolateevent/ or in the slideshow below. Simple Double boiler made out of cheap pet dishes from petsmart, was also demoed for melting/dipping chocolate. Thank You everybody who made it out! Also a huge Thank you to The Candy Lady And to Senior Murphy for providing samples! Quick reminder, join us for our monthly General Meeting this Sunday and help us out getting this new year off on the right foot! Big news! We are now a registered NM Non-Profit and we are very close to having everything ready with our 501(c)3 sponsor, so we need to get hopping on hunting down some donors, and grants! We need you for that! This is all at our headquarters, 1112 2nd Street NW! Be there! Just as a FYI Quelab will not be officially open for hacknights Sunday the 25th or Sunday the 1st, Due to member holiday obligations. This does not mean the lab has to be closed. But just dont expect it to be open (feel free to drive by and if the open sign is on, there may be someone in there! (or recently was)If there are any bored members who need a place to slip away and hack feel free to post to the members list, or to the forums http://quelab.net/wordpress/forums/ that you will have the place open. It will be up to you to make sure the place is locked up at the end of the night. Otherwise hope to see some of you Tuesday the 27th, for our post holiday new gadget show&tell / boxingday old gadget give away, and hacknight. Our next board meeting,(for board and members) Will be Sunday January 8th, 5-6pm, and our planning/public meeting will be 6:30-7:30 Also on January 8th, please try and come we need input! Crowdfunding or micro funding, has become a popular – and useful – way of raising funds for projects of all sorts, from movies to games, hardware, organizations and more. But while thousands have joined sites like Kickstarter and IndieGoGo to help take their project to the next level, the majority of projects are still not funded. Edit: The session will be at the Harwood Arts Center So we can accommodate more people!